Preheat oven to 350. Grease, spray with baking spray or line 18 wells in a muffin tin. In a large bowl, whisk together the flour, cinnamon, baking soda and baking powder. Set aside. In a separate bowl, mix together the eggs, sugar, pineapple, yogurt, oil and vanilla. Slowly stream in the dry ingredients and mix until well incorporated. Fold in the mashed banana and then the pecans. Divide the batter evenly into wells. Top each with a pecan, if desired. Bake about 20 minutes or until a toothpick inserted into the center of the center muffin comes out with just a few moist crumbs. Remove from the tin and cool on a wire rack. Hummingbird Cake is a Southern favorite. It first appeared in Southern Living in 1978 as part of an article about making the most of bananas. I've never had the chance to make one before but I've always kept in the back of my head as something to try one day. It combines pineapple, which I love, and bananas, which my husband loves into one moist cake. Recently Yoplait approached me about creating a recipe using their new flavored Greek yogurt, and I saw it came in pineapple, I figured now was the time! Rather than make a big cream cheese-frosted cake, I thought I'd make some breakfast-ready muffins instead. I love using Greek yogurt in muffins (as my archives will attest) because it makes the muffins so moist without being heavy. The pecans, banana and cinnamon make this muffin reminds me of autumn days spent making banana bread but the pineapple adds a little tropical punch. 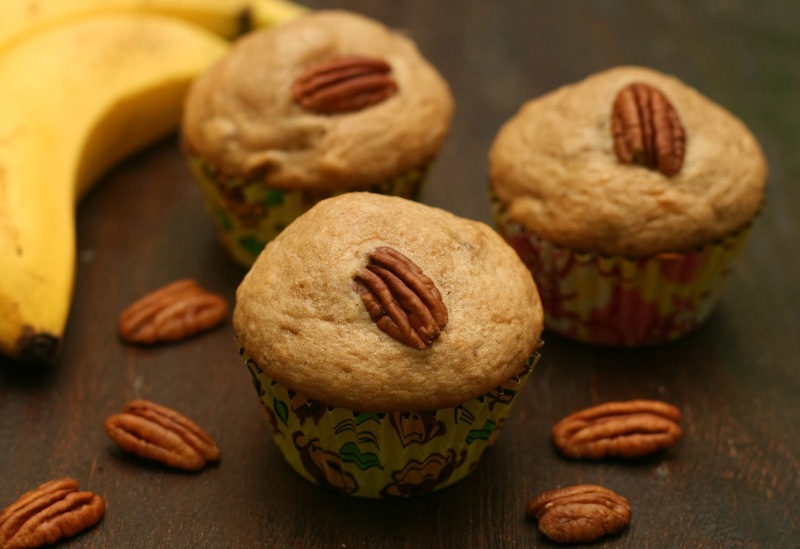 My husband said they were his new favorite banana muffins: moist and light with a nice crunch from the pecans.